These maps contain fish species and size data, mapped to their approximate capture location. Study participants recorded fish location to the nearest 1/10th of a mile, so fish locations are not exact. If you were looking for a hot fishing spot, sorry! 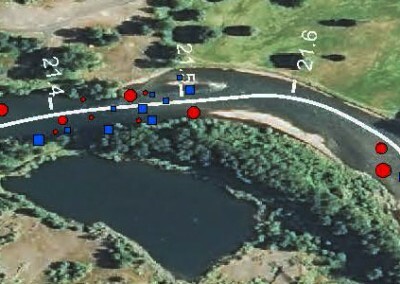 The data is mapped along rivercourse centerline, overlaid on aerial imagery for a given study season (2013 imagery not available as of mapping date; map uses 2012). 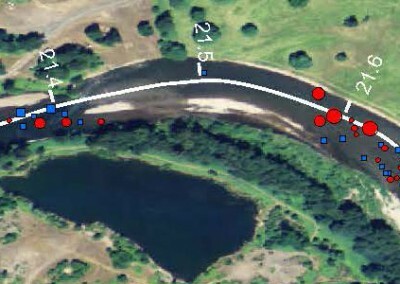 The rivercourse changes fairly substantially over the four years of the study – as do the spots which produced fish! Let’s examine the section from river mile (RM) 22.9 to 22.4. 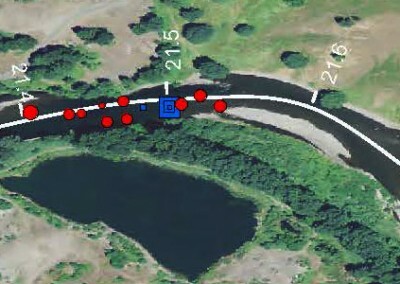 This half mile section features a tailout at RM 22.9, a riffle and gravel bar at RM 22.8, a large, deep hole at RM 22.6, and that hole’s tailout at RM 22.5. This section was reshaped dramatically in the winter of 2010-2011, and again in 2011-2012. As the rivercourse and habitat type changed, so did the species and size of fish we caught. A few medium-sized rainbow were caught and tagged on this corner in 2010. Just below RM 22.5, we caught a large cutthroat – >375mm (14.8″) fork length. Big changes in 2011. Lots of rainbow trout, including a few big ones, indicated by the large red bullseyes. These trout are > 450mm (>17.7″) fork length. In fishermen’s terms, that’s an 18″+ trout. The high water of winter 2011-2012 reshaped this corner dramatically. The wingdam that used to span half of the river disappeared. The island at RM 22.8 was also rearranged. There’s an even balance between rainbow and cutthroat, but all are smaller fish. Lots of small rainbow, with some medium cutthroat mixed in. Here’s another section which changed substantially over the four years of the study. 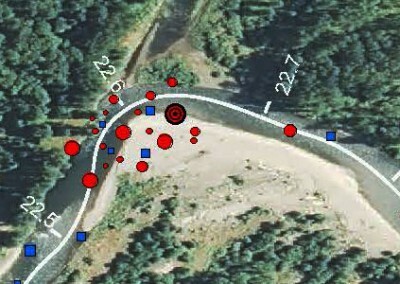 This half-mile section features a tailout at RM 21.75, a shallow riffle which runs from RM 21.7 to 21.4, and a deep hole at RM 21.3. Notice how much of the north bank disappears from 2010 to 2012 – over 150 feet of river bank was lost to erosion! In 2010, this area produced a handful of medium-sized rainbow trout. One large (>375mm) cutthroat was caught at RM 21.5. The winter of 2010-2011 brought high water and a new channel at RM 21.5. About 50′ of the north bank eroded and was replaced with a narrow chute. This section was much more productive in 2011 than in 2010, with some very nice rainbow caught at RM 21.7, and a fair number of medium cutthroat throughout the section. Another series of high water events in the winter of 2011-2012 eroded more of the north bank. 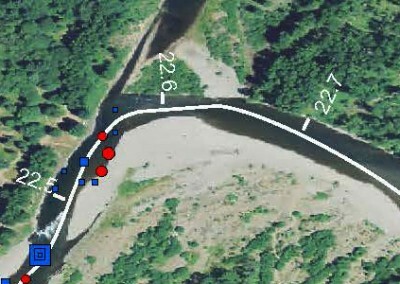 The hot spot for large rainbow trout shifted downstream slightly, and more smaller cutthroat were present in the upper riffle. However, only one fish was caught at RM 21.5 in 2012; a small cutthroat. A great balance of small, medium, and large fish were caught in 2013. Anglers saw action from both rainbow and cutthroat in this section. Though the files are large, they’re worth the wait! 2013 wild trout catch distribution, overlaid on USDA National Agricultural Imagery Program (NAIP) DOQ photos. 2012 wild trout catch distribution, overlaid on USDA National Agricultural Imagery Program (NAIP) DOQ photos. 2011 wild trout catch distribution, overlaid on USDA National Agricultural Imagery Program (NAIP) DOQ photos. 2010 wild trout catch distribution, overlaid on USDA National Agricultural Imagery Program (NAIP) DOQ photos. 2010-2013 wild trout catch distribution, overlaid on USDA National Agricultural Imagery Program (NAIP) DOQ photos. These maps show species-by-species spatial distribution over the four years of the study. 2010-2013 wild trout catch distribution. 2010-2013 wild rainbow trout catch distribution. 2010-2013 wild cutthroat trout catch distribution. 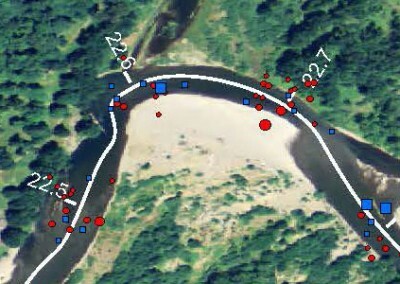 2010-2013 hatchery trout catch distribution. Find out about our radio telemetry pilot study.